The Grand Budapest Hotel, the new demi-farce written by Wes Anderson and Hugo Guinness and directed by Anderson, is like a box of chocolates. The outside is lovely to look at, even entrancing, and when you open it up, the chocolate itself gleams with droolful anticipation. And then you bite into one and sometimes you get the deep, rich double chocolate you have always dreamed of, and sometimes you get the sour cherry cream (or whatever ingredient you consider to be the one you grimace at and throw back in the box after taking one quick bite). The Grand Budapest Hotel is not just gorgeous on the surface, it is often absolutely stunning, even absurdly so. No matter what you may think of it, that is one thing that cannot be denied. The sets, the costumes, the makeup and hair styles, the cinematography, everything from the delightfully cartoon like miniatures to the detailed hotel interiors that make the Shining look like a Motel 8 to the carefully groomed characters who seem made over by the stylists who work 24/7 during Oscar time, it is all stunning, darling, simply and uncontestably stunning. 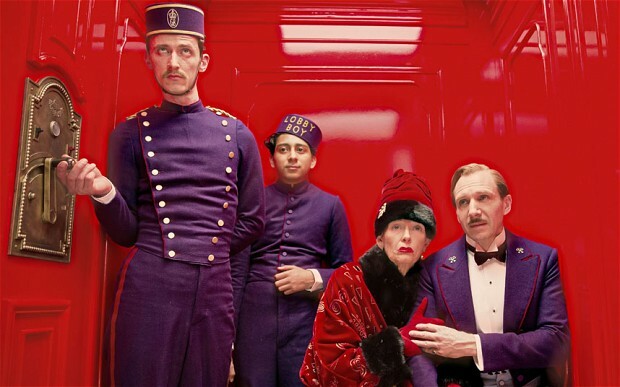 And in turn, the various actors involved have been posed in careful and loving tableaus against these stylistic backdrops by director Anderson as if each shot could be sold as a postcard in the Grand Budapest lobby; or in preparation of a coffee table book on the great hotels of history; or maybe just the windows at Macy’s during Christmas time (whatever floats your boat). Just add that delightful music, a folksy balalaika of a buoyant tune by who else but Alexandre Desplate, to the whole shebang and what more could one want? Well, to be honest, I suppose for me, I’d have to say that, well…more. Yeah, okay, like Oliver Twist I wanted a little more. So sue me. Because as lovely as the whole thing is, as I bit into chocolate after chocolate, I found the whole box falling a bit flat along the way until the selection lost steam and stopped going anywhere clear or that interesting. A young woman comes to a cemetery to leave a hotel key at the gravestone of a famous author. As she begins to read one of the author’s book (TGBH, but of course), the story dissolves to the writer (Jude Law without a hair piece and I can’t say he really needs one) who tells the story of his meeting the owner of the Hotel, Mr. Moustafa (F. Murray Abraham, who, with Inside Llewyn Davis, seems to be just popping up all over the place these days, like a good penny), who then relates how he got the Hotel himself from M. Gustave, the greatest concierge at the greatest hotel in the world (an effete Ralph Feinnes looking like he is simply having just the most marvelous time of his life). And on the eve of World War II no less. There are several reasons why this film never really works for me as well as it might. The first is that the story has two Macguffins, neither of which drive the plot. One is a stolen painting that gets hidden away almost as soon as it is introduced and no one notices is missing until half way through when the next Macguffin, a second will, takes over, but no one really knows it exists or where it is (except for the audience), so it doesn’t really help things move forward either. The plot turn that seems to be driving much of the proceedings is who murdered the aged, wealthy and dynamite in bed Madame D. (an amazing Tilda Swinton under a ton of convincing make up). But even that only fitfully gets things going as other matters, like a love story, that stolen painting and the will redux, constantly get in the way. The second reason is the character of the young Mr. Mustafa (or Zero, the lobby boy, as he is known—I guess you can tell the movie is American or he’d be called Naught). As easy as Abraham wears the role as an adult, Mustafa the younger is played Tony Revolori, and he just can’t quite seem to pull it off, sad to say. He’s game, you got to give him that, but he has too little personality to bring to the role and by the time the whole thing’s over, it’s a bit hard to believe that Revolori could ever have grown up to be Abraham. And that’s only part of the problem here. Zero is taken on as Gustave’s protégé, his assistant, the one he decides to personally groom and share his adventures with. But for the life of me, I could never understand why, what it was about Zero that would remotely make Gustave the least bit interested in him. Well, actually, there is one reason I would buy. Guinness and Anderson toy with the idea of making Gustave bi-sexual. Feinnes plays the role as if he were second cousin to a three dollar bill in Oscar Wilde’s pocket and he is accused of being gay by one of the characters (and as Gustave says, he goes to bed with all his friends). And there is that great line that Feinnes makes more than the most of: “Take your hands off my lobby boy”. But no, the two writers just can’t seem to go there, which is too bad, because that would have given a strong motivation for Gustave and Zero’s relationship. But without something like that, this part of the story never really makes a whole lot of sense. And the movie has the most cavalier attitude toward death. People expire, or the audience is told of their demise, with a flick of the wrist, a flirtatious toss of the head, a blink or you’ll miss it off handed remark. Major participants in the story are just disposed of as if they were never in the movie at all. I suppose that if it had been done right, it could have been funny. But I’m not sure anyone in the audience laughed. And because the deaths are so dismissive, there’s no emotional reaction to them either. It’s just confusing. The cast is filled with the usual suspects one finds in Anderson’s films, as well as some bounders. Anderson seems to have become the new Woody Allen in that anybody and everybody is willing to be in the movie no matter how small and unimportant the part. I have to be honest and say I’m not sure why. None of these roles have any real meat to them, like they would in an Allen film. Most are lacking personality and many of the actors (like Adrian Brody, Edward Norton, Jason Schwartzman, Bill Murray and Owen Wilson, all of whom have given wonderful performances in the past) can’t do much with what they are given. In the end, you don’t react to their performances, you just start whispering to your friends, “Hey, there’s Adrian, and that’s Edward and oh, right, of course, there’s…”, well, you get the drift. There are exceptions, of course, and it’s amazing what Tom Wilkinson, Harvey Keitel, Jeff Goldblum, F. Murray Abraham and Jude Law can do with what little they have. But all of these are actors who can bring something to a role even with there is no there there (they’re very reminiscent of the actors that studios would put under contract in the 1930’s and ‘40’s to fill in the character parts). In the end, it’s really only Feinnes who gives the movie any life and energy it has and if the movie hadn’t constantly cut away to Zero to follow his story, Feinnes might have been able to carry the whole thing off on his diva like shoulders alone. He is pretty fabulous. But he’s only one piece of chocolate in a box. God, I do that over and over again. And what makes it worse, I’m aware of it while writing and I still do it. Thanks, Jim, I made the corrections. I hear you I viewed the film with no idea what it was about. Also not being a fan of the previous work of the director but yet I knew while watching it he must have done the royal tenebaums which is the only other film of his I’ve seen but I’ve wanted to see others based on the cast. I agree what a waste of talent giving them limited cameos. They should have been used longer or in a shorter film. I can’t say it lost steam. To me once it picked up I was into it but I kept wondering where it was going. Thinking to myself this would have been a better book. Thanks for the comment. Anderson makes movies beautiful to look at, but not always of the most emotionally involving. I would recommend Fantastic Mr. Fox and Rushmore as his best films.